Editor’s note: This is part 2 of a 2 part series. Read part one part one here. At Imagine with Orange, we created a slightly different reward: based on the request that some ideas’ owner wanted to move forward on the implementation of their idea, we provide coaching on ‘innovation design’ – guidelines cover design thinking/lean start-up, marketing mix, value proposition pricing, and business model innovation- to make the idea turn into reality: share your ideas, Orange is helping you to give them life; this coaching now includes participation to training sessions of the Orange Fab, Orange corporate accelerator, access to Lab Orange product testing facilities, and exposure across relevant Orange marketing events; some contests have been directly followed by Hackathons were Imagine’s winners were able to form a team, dig into the potential of their idea leveraging collective intelligence, and unearth an MVP. The selection process for best ideas can be a bottleneck if you collect many ideas, and rely only on a jury composed of a few people. Therefore, we recommend to leverage the ‘wisdom of the crowd’, and take into account the comments and votes shared by the community to let the selection rise: the community is shaping the innovation. The main difficulty, compared to participative innovation which is played in ‘closed garden’, is to reach out a sufficient number of people willing to share their creative ideas with you: it requires a strong brand awareness, and active community management, curating and challenging the ideas, social media presence, and nimble connections with targeted influencers. We, at Imagine with Orange, are passionate about innovation from all over the world, and I suppose that’s the reason why +1000 ideas from 29 countries have been shared on the platform over one year. Participative Innovation and Open Innovation with the Crowd seem separated by the boundaries of the company. But innovation knows no borders, and some companies are experimenting innovations platforms where employees meet with the crowd to generate creative ideas. Thus, they add internal and external communities, cross different points of view, and foster group-wide emulation. With Imagine with Orange, we have experienced a cross-process where Orange Labs employees were able to share the non-confidential part of their projects with the international Imagine community, getting immediate and accurate feedback, and letting the voice of the customer enter the innovation process from the very beginning; in the long run, we believe a campaign with Imagine should be a mandatory ‘Feedback Loop’ for a start-up or an intra-preneur, a ‘Test and Learn’ step to gauge market appetence, and collect meaningful insights from massive idea sharing. 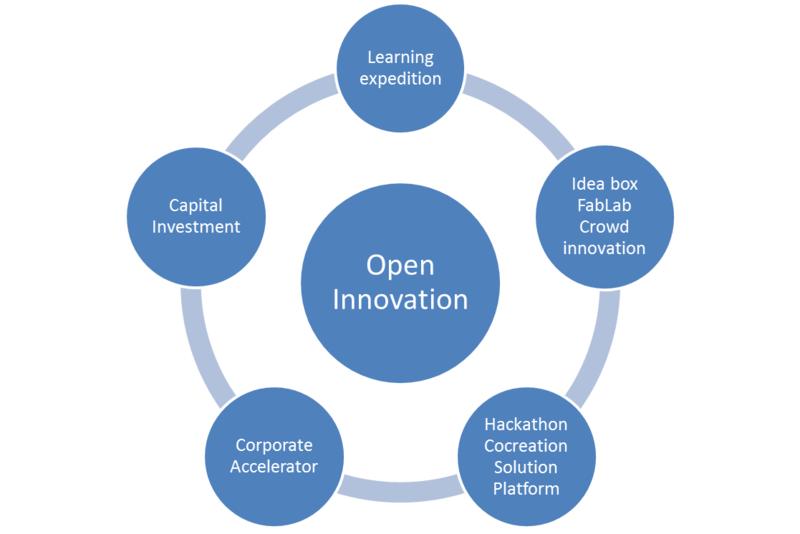 It’s funny how Open Innovation, which was intended for going outside, is now coming back within the company walls with Participative Innovation. Actually, there seems to be endless ways for practicing open innovation, which is absolutely fine. Just be aware to build something consistent in the end, from your corporate and start-ups partners point of view, as well as for your employees, and facilitate the teamwork which lets one initiative nurture another.